This Chocolate-Swirled Vanilla Blueberry Bundt Cake is one cake that packs in a lot of flavors, making it a crowd pleaser for just about any occasion! The cake starts with one batter, but is divided into vanilla and chocolate portions. To the vanilla batter, I added a generous handful of blueberries (I used fresh, but frozen can also be used) and, to the chocolate, I added some mini chocolate chips to make it even richer. All the flavors come together beautifully in a cake that looks as good as it tastes. To create the swirl, the batter must be layered in the bundt cake pan. First, spoon in half of the blueberry batter and spread it into an even layer. Next, spoon in the chocolate batter and spread it gently so that it covers the batter beneath it. Finally, spoon on the remaining blueberry batter and spread it out as evenly as possible. You can give the batter a gentle swirl with a butter knife, but I like to see a slightly thicker stripe in this cake, so I typically skip the swirl and let the batter form one on its own. The finished cake looks gorgeous when it is cut. You’ll see purple blueberries in a white vanilla batter next to a ribbon of dark chocolate, and you’ll get to taste all of those flavors in each bite! The chocolate is rich and satisfying, and the blueberries have a wonderfully jammy sweetness. While those two flavors will seem to dominate the cake, it’s the subtler vanilla cake that allows them to come through so well. I don’t think this cake needs any frosting – particularly if you have a bundt pan with a detailed pattern to it. I often simply serve the slices with a spoonful of whipped cream and a handful of extra blueberries. To dress it up a bit, finish it with a dusting of confectioners’ sugar or a little drizzle of chocolate glaze. Preheat oven to 350F and grease a 10-inch bundt pan. In a small bowl, combine 1/4 cup brown sugar, cocoa powder, hot water and 1/2 tsp vanilla extract. Whisk until smooth and set aside. In a large bowl, cream together butter and sugar until light. Beat in eggs one at a time, followed by the vanilla. Working in two or three additions, alternate adding flour mixture and buttermilk to butter mixture (ending with addition of flour), mixing until no streaks of flour remain. Transfer 1 cup of cake batter back into the medium bowl, then stir in cocoa mixture and mini chocolate chips, mixing until smooth. Fold blueberries into remaining vanilla batter. Spoon half of the vanilla batter into the prepared bundt pan a and spread into an even layer. Spoon on chocolate batter, spreading it carefully into an even layer, followed by remaining vanilla cake batter. Bake for 45 minutes, or until a toothpick inserted into the center comes out clean or with only a few moist crumbs attached. Allow cake to cool in the pan for at least 20 minutes before turning it out onto a wire rack to cool completely. 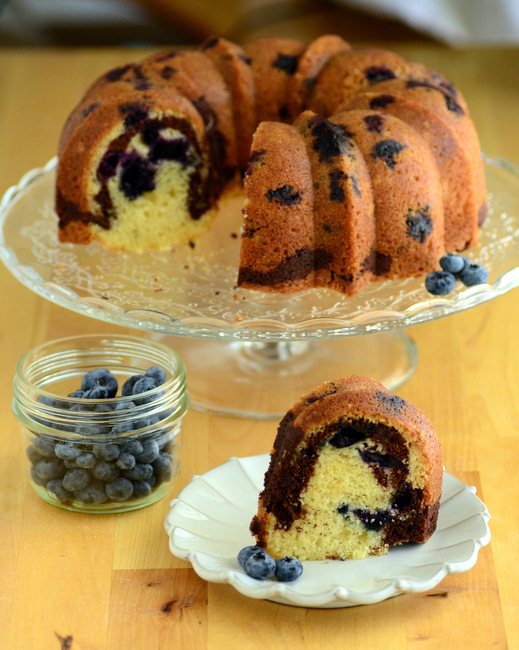 Thank you for a beautiful blueberry bundt cake recipe. Made this tonight for my family and the kitchen smells divine. It tastes even better.